Democracy comes with a warning label: it has to be handled with care, is always a work in progress, it is prone to abuse and demands patience. The 2017 elections were a case in point: a lot of proven non-performers got voted out and some crooks won again by employing their old tricks. Party stalwarts suffered shock defeats, and some aparatchiks worked the vote banks to be re-elected. The alternative anti-corruption parties started from zero to garner sizeable votes, but not enough to win seats or become national parties. It has been six months since the mayors, village chiefs and ward committees were elected. By now we should have started seeing some improvements in living conditions. Yet, the old woes are worse: the cities are still dust bowls, the highways are death traps and earthquake reconstruction hasn’t picked up. In Far-Western Nepal, as our story shows, wrangling between local governments and district administrations over budgets is actually costing lives. Another report reveals how local governments have to start licensing groundwater, as aquifers across the country dry up due to over-extraction. Kathmandu’s newly-elected mayor is a disgrace: of the 101 tasks he grandiosely vowed to complete in his first 100 days he has not even carried out one. On the contrary, Mayor Bidya Sundar Shakya of the UML has desecrated heritage sites like Kasthamadap and Rani Pokhari. Who would have thought a Newar mayor would devalue the living traditions of the Valley, and work to actively destroy them? The only tradition Shakya seems to be upholding is incompetence, greed and corruption, which have become the hallmarks of Nepali politics. The mayor has let his voters down, with his priorities appearing to be acquiring a gas-guzzling SUV, a plush office and the other material trappings of his post. Shakya had promised to rid the Kathmandu Valley of air pollution and traffic jams and remove dust, mud and potholes from the streets. He also made other sweeping promises, like opening subsidised restaurants for the poor and a parking mall. But he has not even delivered on basic promises. 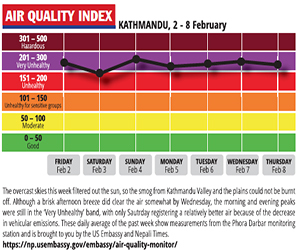 Air pollution this winter is consistently in the danger zone, and this week it was in the 'Dangerous' purple band most days, as shown in the weekly chart based on measurements from monitoring stations in the city centre. In July, when Prime Minister Sher Bahadur Deuba ordered all government authorities to expedite fixing the streets, Shakya refused, arguing that money spent in repairs during the monsoon would be wasted. 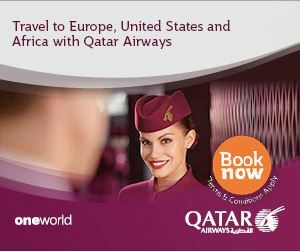 The rains stopped four months ago, yet nothing has been done. The problem is not that problems still exist, but that Mayor Shakya has not set in motion any coherent strategy to deal with them. He seems to think the historic Rani Pokhari can be converted into a commercial centre, Rana-era buildings should be torn down and replaced by concrete blocks and that he can build underground parking and office towers, instead of making Kathmandu more habitable and preserving its priceless past. With the Left Alliance doing victory rolls, we can expect the mayor to be even more supercilious and bulldoze decisions. 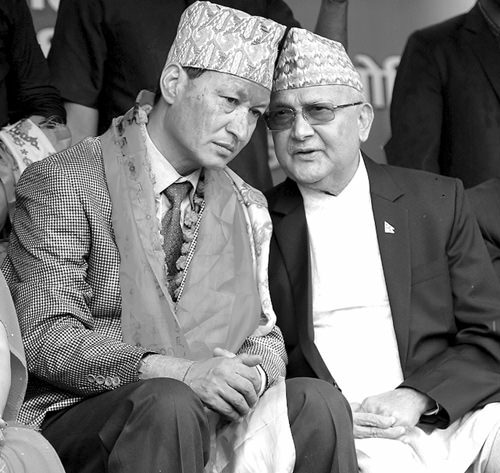 Prime Minister-in-waiting KP Oli is Shakya’s godfather, and we dread to think what the next five years will mean for Kathmandu. Meanwhile, more honest and accountable mayors and village chiefs across the country have been in legal limbo as the political parties try to hang on to their decision-making and revenue control powers. Things are even more messy because of the confusion over the jurisdiction and division of powers of the new provincial governments. Added to all this is the corrosive post-election national politics in which what remains of the decimated Democratic Alliance is playing sore loser, while the triumphalist Left Alliance thinks it can now do anything it likes. The President has been caught in the middle of this tug-of-war, with her UML antecedents making the NC suspicious of her intentions. She is in a dilemma because the ordinance has such large legal holes they can easily be challenged in the courts. It is a chicken-or-egg about which comes first: the Upper House of Parliament or when Prime Minister Deuba is going to hand over to Oli (see Dinkar Nepal on page 4). In a democracy, people are sometimes swayed by populism to make mistakes and elect despots. In Kathmandu, people made a blunder by electing an incompetent mayor, who is loyal and accountable only to his party boss. Even elsewhere in the country, where people voted for stability as the avenue to prosperity, there are already early signs of disillusionment because nothing seems to have changed.